Notre Dame concludes the 2012 FBS season with an incredible goal line stand to secure a (12-0) season to secure the top seed in this researched based 16 team playoff format. And finally, most impressively the BCS National Championship Game versus an opponent yet to be determined by the subjective voters and computers analysis. The difference between the “official” national championship game and my researched based playoff format is that all 124 FBS programs are considered for the 16 spots depending on their FINAL regular season record. Most importantly,each individual FBS program is considered pending that they are not on NCAA probation. With that said, if (12-0)Ohio State were eligible then where would they be seeded if they possess the same record as Notre Dame? The answer to that question is that, Ohio State would be seeded #2. Since Ohio State is ineligible who will be seeded #2, that’s the mystery. With the 2012 FBS season concluding next weekend with five conferences; the Big East, the Big 12, the Mountain West, the Sun Belt and the Western Athletic finishing with conference games the seeds will not be released until early Sunday morning. I can offer this tidbit of information, the following are in the playoff format with seeds to be determined excluding Notre Dame who has earned the #1 seed. With 7 spots secured that leaves 9 spots with a possibility of 14 FBS teams to be examined for the remaining 9 spots. It does appear that 10-2 is the record to be achieved to be considered for the field of 16. Being 9-3 may not enough to get in when in some seasons it’s enough to be at least considered. Hopefully your (10-2) team will be selected and even not they will play in a prestigious bowl game. 2 Non-BCS/FBS programs secure 2 of the 15 remaining playoff spots with victories today on the last weeks and final games of the FBS season. Both Northern Illinois and Kent State both ended the season with a 11 wins, which secures their spots. Kent State ran off 10 wins in a row, while Northern Illinois ran off 11 wins in a row. Of the non-conference victories that were earned by Kent State were at Army(IND) and at Rutgers(BE), while Northern Illinois earned wins versus at Army(IND) and home versus Kansas(B12). Northern Illinois almost finished the 2012 FBS season as one of the undefeated FBS programs, but lost the first game of the season to Iowa(B12) at Iowa(B12) 16-17. The lone loss that is the only blemish on Kent State’s record was at Kentucky 14-47. Both of these FBS programs earned these 2 playoff spots with seeding placement to be determined upon the completion of the 2012 season and/or when all playoff eligible programs are being considered. With 3 playoffs spots secured by Notre Dame, Kent State and Northern Illinois, that leaves the possibility of 34 FBS programs in the final weeks or final game to secure one of the remaining 13 spots with seeds to be determined. We will all be glued to our televisions this weekend to watch how the remaining games to be played turn out. There will be upsets I am sure, as well as close games and blowouts. There will be more surprises in final 13 spots as well as who is seeded where. BCS: Notre Dame secures spot in Playoff!!! With the 2012 FBS college football season drawing to a close, Notre Dame has secured one of the hypothetical playoff spots in my field of 16 teams. Notre Dame’s seed position is yet to be determined. However, the 5 years of college football research in which was performed by myself, examined that from 1996 to the present, that any FBS team that earns 11+ victories are 100% guaranteed a seed within the field of 16. Since 1996, the largest number of 11-win FBS programs were 8, in 1998 and 2001. Lets not forget about Ohio State, if not placed on probation by the NCAA would have also secured a playoff spot like Notre Dame with seed to be determined. By playing by the rules, Ohio State or any FBS program could be playing for prestige, honor and national notoriety. This excludes the increases in media exposure, recruiting and financial gains by participating in additional games. There are specific criterion that determines the field of 16 in my playoff format. Although hypothetical for now, the criteria possesses NO vested interest, NO human polls and NO computer calculations. The seed selection process is determined by multiple variables that are determined within the current season and no hypothetical situations. The remaining 15 spots in my playoff format are still up for grabs. However, as the 2012 season concludes, the current situation is as this for the remaining spots. I will not specifically name any FBS programs currently competing for the remaining seeds, until they have actually secured one of the 16 spots. Of the current (9) 10-win FBS teams, there is an 80% significance that they secure a spot within my field by earning their 11th win. By earning the 11th win, they are 100% guaranteed to secure a spot in the filed of 16, with seeding to be determined. There is still a chance that some or all of these (10) win FBS programs lose this week staying at (10) wins. Of the current (13) 9- win FBS teams, they can become part of the (10) win with an 80% significance in securing one of the 16 playoff spots. By ending the season with 10 wins, the significance of securing one of the 16 playoff spots is significant. By ending the season as a (9) win FBS team, there is only a less than 9% significance in earning one of the 16 seeds. The largest number of 10- win FBS teams were 10 in successive years, 2006 and 2007. However, in 2007 all (10) 2-loss FBS programs made the field of 16. In 2007, of the (15) FBS teams with 2-losses (10) made the final field of 16. Does this mean that an FBS team currently with (8) wins looking for the 9th or even 10th are not being considered, No. They still have an “FAIR” opportunity to make the field of 16. There are 2-weeks still left of the FBS football 2012 season, but many finish the regular season this coming weekend. Only the Big East, Big 12 and the Army/Navy game extends into the first weekend of December. Conference Championship games are not take into account when the selection process. I will not explain why for now. You will surprised at who is being seeded where………..stay tune for more. The reign of the SEC empire falls! I predicted on twitter in the beginning and during the course the 2012 FBS season, that NO SEC program would finish the season with 0-losses.Does the SEC possess credible programs, yes. But the experts within the major media outlets of television and radio were significantly positive about the SEC repeating, most notably Alabama. What are the contributing factors to the SEC empire falling from the graces of glory and praise. Too many programs in the conference. This just supports my research and theory based upon increased number of teams in one conference increases mediocrity. The SEC lost twice to 2 Sun Belt Conference(SBC) programs at Home and 4 close calls versus SBC programs at Home. Just think if those SBC teams won 2 out of the 4 closes ones. This would have significantly decreased the credibility of the SEC. The significant hedonistic control of their non-conference schedule and never playing away from their home field. Sooner or later the 79.8% home field advantage that the SEC possesses since 1996, is going to catch up with you in the long run. The significant 90.1% non-conference home field advantage that Alabama possesses from 1996 definitely does not prepare them for tough games in adverse conditions as the season concludes heading into the clubhouse turn. Finally, the significant increase in scheduling the FCS programs from 50% in 2006 to 100% in 2012. That’s a 233% increase in 6 years of scheduling FCS programs. These are just the primary contributors to the SEC empire falling from the graces of the BCS as the years added up. Being the money whores of college football, maybe the SEC teams should invest some that financial accolades earned and schedule somebody of caliber, away from the southeastern region and not in a neutral site.What the SEC fears is losing, just like any other FBS program. The SEC is well aware of that losing early or 1-loss will significantly decrease their chances of playing for the title game. That’s why the SEC controls and manipulates as many of the computer variables possible making the perception of their accolades better than what reality tells us. Final Thought: To prepare for the higher level of competition towards the end of the season you must prepare your team with better competition during the course of the season. That means putting your team in an un-familiar position and conditions on the road away from home cooking, excluding conference games. This will better prepare your team as you come out of the clubhouse turn and heading toward the finish line. I guess the SEC is worried about making money versus preparing their kids for adversity in life as the season concludes with tougher competition. The SEC concludes with 6 FCS teams next week before rivalry week. Just another scheduled blow out and statistically significant win for the SEC. In the future, the SEC should schedule D2 and D3 programs towards the end of the season. I guess my point is well stated and proven. Is Kansas State better than Alabama…..The perception by the subjective voters who’s decisions are not weighted based upon criteria, but opinion and some vested interest. Using the same criterion as in the previous posts with the SEC and Big 10, it can be determined that the Big 12 along with the Big 10 are slightly or significantly statistically better than the SEC. Even though the current perception is that the SEC is “the best football conference in the FBS”. The reality is by examining the same statistical categorical variable between the 3 FBS/BCS conference, it can be determined that both the Big 10 and Big 12 are the better FBS/BCS conferences within the integrity of the non-conference schedule, taking a significant risk of playing more non-conference games on the road and a decreased rate of scheduling FCS programs. Since 2006, The Big 12 has NOT significantly increased their FCS scheduling rate, like the SEC . In 2006, the Big 12 scheduled 9 FCS opponents and the same number of FCS opponents in 2012. The The Big 12 has scheduled 56 FCS programs, that’s 15 less than SEC and 6 less than the Big 10. Those 56 FCS games account for 19.5% of the Big 12’s non conference games. Since, 2006 the Big 10 scheduled 302 non conference games, slightly less than the SEC and Big 10. This is due the fact that both Colorado and Nebraska left the Big 12 after the 2010 season, then Texas A&M and Missouri left after the 2011 for other FBS conferences. The addition of TCU was not taken into account for since this is TCU’s 1st season in the Big 12 and the season is not complete. Comparing the non-conference win loss percentage rates between the 3 FBS conferences, the Big 12 possesses a significant higher rate than the SEC. The Big 12 win-loss rate for non conference games home games since 2006 is (193-29) at 86.9%. That review of the non conference schedules includes scheduling less non conference home game and more road games than the SEC. The Big 12 scheduled 229 Home games with 73 away games with a 75.5% home field advantage rate.. The exact same rate as the Big 10 and significantly less than the SEC which possesses an 81.8% home field non conference scheduling advantge. The Big 12 scheduled 160 Non-BCS programs since 2006, with 122 home games and 38 away games. Those 38 non conference games scheduled vs. Non-BCS programs is significantly 100% more than the SEC whom only scheduled 19 since 2006. The Big 12’s scheduling practices with BCS programs is significantly more fair and even in a home and away scheduling practice but not in total games scheduled with other BCS programs. The Big 12 scheduled 76 BCS programs but 41 of them Home and 36 away. Similar to the Big 10 but less than the SEC. Let’s review and compare the Big 12 like I did with the Big 10 and SEC. Colorado, Nebraska, Texas A&M and Missouri will be included in this review since all three were historically part of the Big 12 before all of the conference jumping. Baylor(3-4, 2012). 19H/7A at a rate of 73.1% with an overall non conference record of (18-8) and a non conference home record of (14-5). Of the non-conference games schedule versus BCS programs since 2006 are: Washington State, Wake Forest, TCU and Connecticut all H/A. Colorado(1-7, PAC12). 15H/5A at a rate of 75.0%. with an overall non conference record of (9-11) and a non conference home record of (9-6). Of the non-conference games schedule versus BCS programs since 2006 are: Florida State 2H, California A along with Arizona State, Georgia and West Virginia all H and A.
Iowa State(5-3). 18H/8A at a rate of 69.2% with an overall non conference record of (17-9) and a non conference home record of 14-4). Of the non-conference games schedule versus BCS programs since 2006 are: Connecticut A and the traditional yearly rivalry with Iowa 3H/4A. Iowa State has scheduled more Non-BCS programs home and away. Kansas(1-7). 20H/6A at a rate of 76.9% with an overall non conference record of (19-7) and a non conference home record of (18-2). Of the non-conference games schedule versus BCS programs since 2006 are: Georgia Tech H and A along with Duke A. Kansas like Iowa State also scheduled more non conference games vs. Non-BCS programs than BCS programs. Kansas State(8-0). 19H/7A at a rate of 73.1 with an overall non conference record of (20-6) and a non conference home record of (18-1). Of the non-conference games schedule versus BCS programs since 2006 are: Auburn A along with Louisville, UCLA and Miami(Fla.) all H and A.
Missouri(4-4, SEC). 18H/5A at a rate of 78.2% with an overall non conference record of (22-1) and a non conference home record of (18-0). Of the non-conference games schedule versus BCS programs since 2006 are: Mississippi H/A, Illinois 1H/2A and Arizona State A.
Nebraska(6-2, Big 10). 17H/4A at a rate of 80.9% with an overall non conference record of (17-4) and non conference home record of (15-2). Of the non-conference games schedule versus BCS programs since 2006 are: Washington A, Wake Forest A and both USC and Virginia Tech H and A. Nebraska did schedule 12 Non-BCS programs all at Home. Oklahoma(5-2). 19H/7A at a rate of 73.1% with an overall non conference record of (22-4) and a non conference home record of (17-2). Of the non-conference games schedule versus BCS programs since 2006 are: Oregon A, Notre Dame H along with Washington, Cincinnati, Miami(Fla.) and Florida State all H and A.
Oklahoma State(5-2). 20H/6A at a rate of 76.9% with an overall non conference record of (21-5) and a non conference home record of (19-1). Of the non-conference games schedule versus BCS programs since 2006 are: Georgia, Washington State and Arizona all H and A. Oklahoma State did schedule more Non-BCS programs with 15 games. Texas(6-2). 20H/6A at a rate of 76.9% with an overall non conference record of (24-2) and a non conference home record of (18-2). Of the non-conference games schedule versus BCS programs since 2006 are: UCLA H/A, Ohio State and Arkansas H and Mississippi A. Texas did schedule the most Non-BCS programs with 19 15H/4A however Texas only scheduled 1 FCS program since 2006. Texas A&M(6-2, SEC). 20H/3A at a rate of 86.9% with an overall non conference record of (17-6) and non conference home record of (16-4). Of the non-conference games schedule versus BCS programs since 2006 are: Arkansas 2H/1A and Miami(Fla) H/A. Texas A&M did schedule 15 Non-BCS programs with 14H/1A. Texas Tech(6-2). 17h/9A at a rate of 65.3% with an overall non conference record of (24-2) and a non conference home record of (17-0). The interesting fact about Texas Tech is that since 2006, they have never scheduled a BCS program during the review of this data. The last BCS program Texas Tech scheduled were Mississippi and North Carolina State both A in 2003. Texas Tech does possess the highest rate of Non-BCS games scheduled within the Big 12 at 18 but 9H/9A. What this data reveals is that the evidence does support that the Big 12 is slightly better than the SEC. The Big 12’s non conference home record is comparable and slightly better than the SEC’s. The Big 12 possesses a non-conference home record of 86.9% vs. the SEC at 86.1% since 2006. The Big 12 significantly schedules less FCS opponents, schedules a fair and credible BCS non conference schedule not only H/A but travels to both coasts and all 5 other FBS/BCS conferences along with scheduling more Non-BCS programs away than the SEC. The SEC has never scheduled the Big 10. The facts are, both the Big 10 and Big 12 are slightly better than the SEC. Like the Big 10, the Big 12 does reciprocate more in their non conference scheduling practices scheduling a H and A series with BCS programs. The Big 12 currently does not possess any program with a non conference scheduling rate higher than 76.9% where as 75% of the SEC possesses a rate greater than 76.9%. If the SEC claims to be the best FBS conference in college football, what fears does the SEC possess about scheduling more non conference games away at FBS conference sites and NOT in neutral sites? What they fear is losing that false sense of perception of being the best and possibly losing that significant opportunity to secure the most bowl berths and the largest bowl financial payouts. The question I have asked many SEC writers and major television sports analysts is, why didn’t Alabama play Michigan in Ann Arbor? Is playing in front of 110K+ fans not good enough or did they fear losing the first game of the season on the road at Michigan which would ultimately and significantly decreasing their chances of playing for the national title. Thus discrediting their false sense of credibility and reign in the FBS. Even at the professional level of sports does not possess 100% control of their schedule. Should the Miami Heat say” no we cant play the Lakers in LA, they must come here or we can play in Orlando”. Should the NY Giants tell the NFL, “wait we play 16 games we get 13 of them at home. We are the defending champions everyone else accept our divisional opponents must travel to us”. Yes the professional levels of sports and college sports is big business and about money. The professional leagues play a 50/50 schedule and still makes money. What makes the SEC special, they make more money and believe they are entitled to scheduling privileges over any other FBS program. The facts supports that the SEC is hedonistically driven and fear losing that presitigious reputation and money. In response to a twitter post from the writers of the Big 10 Conference in which the Big 10 was being criticized for their non-conference schedule being soft or lacking credibility. Contrary to dis-belief but the Big 10 is significantly better than the SEC in many categorical variables which would determine credibility. Taking the same reference point as the recent October 19, 2012 article written by the author from the Tampa Bay Times as 2006, which I used as the examination point for the SEC in the previous post. This is what I have examined using the same historical facts and non-conference scheduling information about the Big 10. Since 2006, The Big 10 has NOT significantly increased or decreased their scheduling of FCS opponents. In 2006, the Big 10 scheduled 8 FCS programs and in 2012, the exact same number. Since 2006, the Big 10’s record is 236-81 with a win loss percentage rate of 74.9%. Comparing the Big 10 to the SEC, the Big 10 scheduled 327 non conference games. Since 2006, The Big 10 scheduled 37 less non-conference home games compared to the SEC. This indicates that the Big 10 took more risks playing more road games versus non-conference opponents. By examining each level of program labels, which was determined by the NCAA and BCS committees, the Big 10 scheduled significantly different than the SEC within their non-conference schedule. Since 1996, the Big 10 scheduled 62 FCS programs, which is significantly less than the SEC’s 72. Of the non conference games schedules versus Non BCS programs, the Big 10 scheduled 162 with 129 at home and 33 away at Non-BCS programs. That’s a difference of 14 more road games away at Non-BCS programs than the SEC. The non conferences games scheduled versus BCS programs by the Big 10, is much less than the SEC. The Big 10 scheduled 91 non conference games versus BCS program with 47 scheduled home and 44 away. The BCS numbers translates into a 51.6% which indicates they possess no home field advantage versus BCS programs. However the Big 10 does possess an overall home field advantage within their non conference scheduling practices possessing a rate of 75.5%. Still not as hedonistic as the SEC. Let review the Big 10 compared to the SEC as in the previous post. Illinois(2-5, 2012). 23H/5A at a rate of 82.1%, with an overall non-conference record of (15-13) and a non-conference home record of (14-9). Of the non-conference games scheduled versus BCS programs since 2006 are: Syracuse, Arizona State both H/A, Rutgers A, Cincinnati A and Missouri 3H/1A. Indiana(2-5). 18H/10A at a rate of 64.2% with an overall non conference record of (18-10) and non conference home record of (13-5). Of the non-conference games scheduled versus BCS programs since 2006 are: Virginia 2A and Connecticut H. Indiana scheduled more Non-BCS programs due to the fact that non of the BCS programs wants to schedule an FBS/BCS opponent due to credibility. Iowa(4-3). 22H/6A at a rate of 84.6% with an overall non conference record of (21-7) and a non conference home record of (19-3). Of the non-conference games scheduled versus BCS programs since 2006 are: Arizona, Syracuse and Pittsburgh all H/A with the traditional Iowa State rivalry being 4H/3A. Michigan(5-2). 23H/5A at a rate of 82.1% with an overall non conference record of (21-7) and a non conference home record of (19-4). Of the non-conference games scheduled versus BCS programs since 2006 are: Alabama A, Oregon, Vanderbilt and Connecticut all H along with the traditional rivalry with Notre Dame of 3H/4A. Yes the games versus Alabama is an away game since Michigan had to travel 5X’s further than Alabama. Michigan State(4-4). 23H/5A at a rate of 75.0% with an overall non conference record of (22-6) and non conference home record of (18-3). Of the non-conference games scheduled versus BCS programs since 2006 are: Pittsburgh H/A, California A and the traditional rivalry with Notre Dame with 4H/3A. Minnesota(4-3). 20H/8A at a rate of 71.4% with an overall non conference record of (17-11) and a non conference home record of (12-8). Of the non-conference games scheduled versus BCS programs since 2006 are: California, Syracuse and USC all H/A. a nNorthwestern(6-2). 19H/9A at a rate of 67.6% with an overall non conference record of (23-5) and a non conference home record of (17-2). Of the non-conference games scheduled versus BCS programs since 2006 are: Duke and Syracuse both H/A, Boston College A and Vanderbilt A.
Northwestern(6-2). 19H/9A at a rate of 67.6% with an overall non conference record of (23-5) and a non conference home record of (17-2). Of the non-conference games scheduled versus BCS programs since 2006 are: Duke and Syracuse both H/A and Boston College and Vanderbilt both A.
Ohio State(8-0). 24H/4A at a rate of 85.7% with an overall non conference scheduling record of (25-3) and a non conference home record of (23-1). Of the non-conference games scheduled versus BCS programs since 2006 are: Miami(Fla.) and USC both H/A, California, Colorado and Cincinnati all H and concluding with Texas and Washington both A.
Penn State(5-2). 22H/6A at a rate of 72.4% with an overall non conference record of (23-5) and a non conference home record of (20-2). Of the non-conference games scheduled versus BCS programs since 2006 are: Notre Dame 1H/2A, Alabama H/A, Oregon State, Syracuse and Temple all H with Virginia A. I believe that when Alabama played at Penn State and not in a neutral site. Alabama’s only real road non conference game that required them to travel further than 800 miles. Purdue(3-4). 21H/8A at a rate of 72.4% with an overall non conference record of (17-12) and a non conference home record of (16-5). Of the non-conference games scheduled versus BCS programs since 2006 are: Oregon H/A and the traditional rivalry versus Notre Dame 4H/3A. Wisconsin(6-2). 22H/6A at a rate of 84.6% with an overall non conference record of (27-1) and a non conference home record of (22-0). Of the non-conference games scheduled versus BCS programs since 2006 are: Oregon State H/A, Washington State H and Arizona State A.
Nebraska(5-2) 6H/2A at a rate of 75.0% with an overall non conference record of (7-1) and a non conference home record of (6-0). Of the non-conference games scheduled versus BCS programs since 2006 are: Washington H and UCLA A. NOTE: Nebraska’s Big 10 credibility and validity to the Big 10 cannot be determined since their is limited numerical data to assess for Nebraska within the Big10. Nebraska’s FBS credibility is more a Big 12 review. Thus I am not saying that Nebraska is not credible or valid to the Big 10. What does this information tell us? It significantly indicates that the Big 10 is a more credible FBS conference more so than the SEC. The Big 10 schedules more BCS games both home and away in a more fair reciprocal scheduling format of H and A. The Big 10 schedules less FCS programs and would prefer to schedule more significant FBS opponents in 3 different FBS conferences such as the PAC10/12, Big 12, Big East and Notre Dame. Which every one in the college football world accounts them as credible not because of the name, but history, tradition and national exposure they bring. The Big 1o does not possess any program with a home field scheduling advantage more than 90% like the SEC which possesses 3 (Alabama, Arkansas and Auburn). The Big 10 also possesses a lower non conference home record compared to the SEC, all due to the fact of playing less non conference home games and significantly more credible FBS programs in a reciprocal H/A non conference scheduling format. With that said, I can determine that those who are trying to dis-credit the Big 10’s non conference credibility are located in a specific southern part of the United States. Needing to self examine their own non conference scheduling practices before throwing stones at others. The data does suggest that the Big 10 is much better, not significantly better, than the SEC within these categorical variables. Those are the facts and the truths. Like Sgt. Joe Friday said ” Just the facts ma’am.. just the facts”…. In a recent newspaper publication within the United States, a sports writer has hedonistically boasted about how none of the remaining 110 FBS programs can compete with the Southeastern Conference. Below is the link to the article for you to read and formulate your own opinion. The article is written from the perspective of how the SEC possesses a significant win-loss record within their non-conference schedule from 2006 to the present. Upon further review of this article which was posted on October 19, 2012; which was brought to my attention from one of my twitter followers to read. The author is quoted stating “It is the most ruthless, most unforgiving dynasty on the planet. It rules college football, and really, no one else is second” (Tampa Bay Times, 2012). If this is not kicking dirt in the faces of the remaining 110 FBS programs, I do not know what is. The evidence from the authors point of view believes to be insurmountable to any other FBS conference at the FBS level. Boasting that the SEC possesses an non-conference win-loss percentage of 81.3% since 2006, additional to the 6 consecutive “so called BCS National Championships”. If the author was as investigative of a reporter, they would have also investigated further versus than scratching the surface. What the article does not investigate is the multivariate variables that has allowed the SEC to position themselves more strategically to be considered for playing in those championship games. As an investigative person that I am with a master’s degree in athletic administration/sports administration; I can say with confidence that I have scratched and researched to the core on the college football topic of BCS or a more traditional 16-team playoff format. 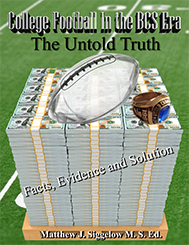 I have spent the past 5-years investigating college football, written a book(in the process of trying to get it published) and examined many multivariate variables within variables to provide the turths and facts pertaining topics such as this article. Below is the missing evidence and facts from the article pertaining to the SEC. The SEC’s dominance is a direct relationship to the controlling, manipulating and significant non-conference scheduling advantages that are never examined by many major sports media outlets either local, regional, national, television, radio or newspaper print. The significance to the SEC non-conference success of possessing a non conference win loss percentage rate of 81.3% since 2006; is that since 2006 the SEC also possesses a 81.8 %home field advantage within their non-conference schedule. That indicates that the SEC scheduled 214 more non-conference games at home. In 2 peer reviewed journal written by Jeremy Jamieson(2010) and R. Pollard & J Pollard(2005); which investigated the significance of home field advantage associated with win loss records to determine if the home filed advantage does possess a significance to a better win loss record. Examining the article author’s facts further and using his reference point of 2006, this is what the author failed to reveal. Since 2006, the SEC has significantly increased its scheduling rate with FCS programs by 233%. In 2006, only 6 SEC programs scheduled FCS programs. In 2012, all 14 SEC programs have scheduled a FCS program. Since 2006, the SEC has scheduled 72 FCS games, second only to the ACC which has scheduled more since 2006 at 74. Those 72 FCS home games account for 26.1% of their non-conference games. Examining the scheduling of the SEC further, the SEC has scheduled 167 Non-BCS programs. Of those 167 Non-BCS programs, 88.6% or 148 were scheduled at home. Only Vanderbilt, Tennessee, Mississippi State, Mississippi and LSU has scheduled a Non-BCS program away. However, LSU only scheduled a Non-BCS program away once. The remaining non-conference games versus BCS programs resulted in 96 total games scheduled. Of those 96 games, 54 or 56.2% were scheduled at home. What many of the SEC supporters comments might include are; “some of those games were at neutral sites” or “our conference is all BCS programs”. With that said, neutral site games are determined either possessing a historic scheduling such as the Texas/Oklahoma annual meeting. Even with that historical scheduling you can significantly determine who will be the home or away team based upon the rotational basis. The games where Boise State came East to play Georgia in a neutral site in Atlanta is not neutral. For that game to be neutral the game should have been played in Nebraska or Kansas, an equal distance between the programs. The most damaging evidence against the SEC which the author left out of this article, was the numerical date within each SEC program since 2006. The evidence below will significantly indicate that the SEC does possess a home field scheduling advantage within their non-conference schedule. All results are from 2006 to the present. Alabama(7-0, 2012). 26 Home and 2 Away, that’s a 92.8% home field advantage within the non conference schedule, additional with a non-conference record of (25-2) and a non conference home record of (23-2); leaving a FCS opponent scheduled at the end of the 2012 season as the remaining non-conference game left. Of the non-conference games scheduled since 2006, Alabama’s BCS opponents consists of: Duke(2H, 1A), Penn State(1H, 1A), Florida State(H), Virginia Tech(H), Clemson(H) and Michigan(H). Alabama only travels 582 miles to Dallas, where as Michigan travels 1180 miles to Dallas. Some neutral site. Many other FBS programs would be national champions or ranked number 1 in the nation too; if they played more games at home. Fact, since 1996, Alabama possesses a 90.1% non-conference home field scheduling advantage with 55H and 6A. Arkansas(3-4). 26H/2A at 92.8% with a (23-4) non-conference record and home record of (22-3); leaving a non conference game at Tulsa left for 2012. Of the non-conference games scheduled since 2006, Arkansas’s BCS opponents consists of: Texas A&M(2H) prior to the entrance of Texas A&M into the SEC, Texas(A), USC(H) and Rutgers(H). Fact, since 1996 Arkansas possesses a 90.0% non-conference home filed advantage. Auburn(1-6). 26H/2A at 92.8% with (20-4) non-conference record and a home record of (22-2); leaving home versus New Mexico State and an FCS opponent for the remaining non confernece games for 2012. Of the non-conference games scheduled since 2006, Auburn’s BCS opponents consists of: West Virginia(1H/1A), Clemson(1H/1A), Kansas State(H) and Washington(H). Fact, since 1996 Auburn also possesses a 90.0% non conference home field advantage like Arkansas. Florida(7-0). 24H/4A at 85.7% with (23-2) non conference record with a home record of (21-1); leaving Louisiana Lafayette, Florida State and a FCS opponent left for 2012. Of the non-conference games scheduled since 2006; Florida’s BCS opponents consists of: Miami(Fla.)(H), South Florida(H) and the annual Florida State game(3H/4A). This is a historical scheduled rivalry which can be accounted for a home and home like Texas/OU. Fact, since 1996, Florida possesses a 83.3% non-conference home field advantage, plus they have never left the state of Florida for a scheduled non-conference games since 1991 at Syracuse. Talk about home field advantage, but yet we call them national champions when they have not left the southeast region of the United State. Georgia(6-1). 22H/6A at 78.5% with (22-4) non-conference record with a home non-conference record of (18-2); leaving Georgia Tech and a FCS opponent left for 2012. Of the non-conference games scheduled since 2006; Georgia’s BCS opponents consists of: Colorado, Oklahoma State and Arizona State all (1H/1A). The annual Georgia Tech game is just like the FLA/FLA St.game with (3H/3A). Fact, since 1996, Georgia possesses a 80.0% non-conference home field advantage. At least Georgia went further West than other SEC programs. Kentucky(1-7). 24H/4A at 85.7% with a (23-4) non conference record and a home non-conference record of (21-3); leaving a FCS opponent scheduled for 2012. Of the non-conference games scheduled since 2006; Kentucky’s BCS opponents consists of none. Kentucky possesses an annual rivalry game with Louisville(3H/3A). Fact, since 1996 Kentucky possesses a 75.0% non conference home field advantage. LSU(7-1). 24H/4A at 85.7% with a (28-0) non conference record and a home non-conference record of (24-0) and no one left to play on their 2012 non conference schedule. Of the non-conference games scheduled since 2006; LSU’s BCS opponents consists of: Washington(2A), West Virginia (1H/1A),Arizona(H), Virginia Tech(H), North Carolina(A) and Oregon(H). Fact, since 1996 LSU possesses a 85.5% non-conference home field advantage. LSU travels 427 miles to Dallas and Oregon travels 2130 miles to Dallas. Again some neutral site. Mississippi(4-3). 21H/7A at 75.0% with a (20-8) non conference record and a home non-conference record of (15-6) with no one left on their non-conference schedule. Of the non-conference games scheduled since 2006; Mississippi’s BCS opponents consists of Missouri(1H/1A) prior to their joining the SEC, Wake Forest(1H/1A) Texas(H). Fact, since 1996 Mississippi possesses a 73.3% home field non conference advantage. Mississippi State(7-0). 18H/10A at 64.2% with a (21-7) non conference record and a home non conference record of (14-4) with no one left on their non conference schedule for 2012. Of the non-conference games scheduled since 2006; Mississippi State’s BCS opponents consists of: West Virginia and Georgia Tech both(1H/1A). Fact, since 1996 Mississippi State possesses a 68.3% home field non conference advantage. South Carolina(6-2). 22H/6A at 78.5% with a (24-2) non conference record and a home non conference record of (20-1); with Clemson and a FCS opponent left on their 2012 non conference schedule. Of the non-conference games scheduled since 2006; South Carolina’s BCS opponents consists of: North Carolina State(1H/1A) and North Carolina(A). The annual rivalry game between Clemson(3H/4H) accounts just like the Fla./Fla. St. rivalry. Fact, since 1996 South Carolina possesses a 76.7% home field non conference scheduling advantage. Tennessee(3-4). 24H/4A at 85.7% with a (22-5) non conference record and a home non conference record of (20-3) with a non conference game versus Troy left on their 2012 non conference schedule. Of the non-conference games scheduled since 2006; Tennessee’s BCS opponents consists of: California and UCLA both (1H/1A), Oregon(H), Cincinnati(H) and North Carolina State(H). At least Tennessee went West to play BCS programs. Fact, since 1996 Tennessee possesses a 81.7% home field non conference scheduling advantage. Vanderbilt(3-4). 18H/10A at 64.2% with a (15-11) non conference record and a home non conference record of (12-5) with Massachusetts and Wake Forest left as non conference games for 2012. Of the non-conference games scheduled since 2006; Vanderbilt’s BCS opponents consists of: Duke, Connecticut and Northwestern each with (1H/1A), Wake Forest(3H/2A), Michigan(A) and Georgia Tech(A). Fact, since 1996 Vanderbilt possesses a 66.7% home field non conference scheduling advantage. Texas A&M and Missouri are not considered as SEC programs until the season has come to a completion. These results indicate that the SEC programs with a 75% or greater non conference scheduling advantage is significantly scheduling 4 Home non conference successive seasons. This successive scheduling practice and rate indicates that the SEC is acting hedonistically to strategically control and manipulate the computer variables which uses numerical information to return a number for a BCS statistical number. This does not even include the human subjective voters opinion based ranking system which is also manipulated. What we can determine by this evidence is that 83% of the 12 SEC programs are significantly acting hedonistically. They fear playing away from their home environments within their non conference schedule to significantly decrease or jeopardize their chances to play for the national title game and increased revenues for the conference. What does this significant evidence suggest against the SEC is that the SEC(Schedule Easy Conference)knows how to controls the variables for strategic positioning versus risking playing away from home. Truth hurts…as Sgt. Joe Friday said on Dragnet “Just the facts ma’am”. Do you ever wonder what goes through the minds of the human subjective voters when they rank the FBS teams 1 through 25? Since the human subjective voters are two-thirds of the numerical data used to determine who are the best FBS programs “supposedly”; what did the human cognitive minds miss when ranking their FBS programs 1-25? Upon further review of this weeks “BCS” rankings, I examined how many of the “Top 10” BCS/FBS programs already played a ranked or previously ranked team within the USA Today Coaches Poll, to determine the significance and accuracy of the current BCS Top 10 rankings. Future scheduled games do not count towards ranked teams played since the rankings are subject to change on a week to week basis. 1. Alabama(SEC)- number of ranked or previously ranked teams played to date(2). Michigan and Arkansas with a combined record of (7-6); but yet ranked unanimously number 1 in all the polls. 2. Florida(SEC)- (1) LSU (6-1). Definitively an un-balanced ranking among all the polls between subjective voters ranked between 3 through 4. 3. Oregon(PAC 12) (1) Arizona(3-3). Unanimously ranked 2 in both human subjective voters. 4. Kansas State(B12)- (3) Miami(Fla.), Oklahoma, and Iowa State(12-6). Split decision within the human subjective voters being ranked 3 and 4. 5. Notre Dame(IND)- (4) Michigan State, Michigan, Miami(Fla.) and Stanford(16-10). Unanimously ranked number 5 among both human subjective voters and computer polls. 6. LSU(SEC)-(3)Auburn, Florida and South Carolina(13-6). Unanimously ranked number 6 among both human subjective voters and computer polls. 7. South Carolina(SEC)-(2) Georgia and LSU(11-2). Split decision within the human subjective voters between ranked 8 and 9. 8. Oregon State(PAC 12)- (3) Wisconsin, UCLA and Arizona(13-7). Split decision within the human subjective voters between ranked 8 and 11. 9. Oklahoma(B12)-(3) Kansas State, Texas Tech and Texas(15-3). Split decision within the human subjective voters between ranked 7 and 10. 10. USC(PAC 12)- (1) Stanford(4-2). Split decision within the human subjective voters between ranked 9 and 11. I can significantly determine that the human subjective voters are not being as investigative as need be to rank their FBS programs 1 through 25. What I can possibly determined is that the human voters are using a biased base format in their subjective rankings. With a plethora of money on the line at the end of the regular season, voting alliances are possibly formed to possess a misrepresentation of reality due to the fact of the money involved. Categorical variables examined and 1996? I have been asked about my research on which categorical variables I examined and why I selected the year of 1996. In reverse order, I selected the year 1996 due to the fact that it was the starting point of when the BCA(Bowl Coalition Association) was formed. Two years later the BCA became the BCS. That’s where the numerical data starts, once the path of determining a national champion in college football changed. The categorical variables in which I investigated and researched for my book and theory, are variables within variables which then became exponential within each variable. My objective was to somehow prove that a 16-team playoff format at the FBS level could effectively be executed, congruent with the current bowl season/system without eliminating any bowl games. From that theory, I can definitively say that a 16 team playoff format can work. Below is a small sample of the multiple categorical variables I examined, researched, analyzed and compared, which led to support my theory, findings and objective. # of home and away non conference games scheduled per FBS Program and Conference. # of wins and losses earned within their non conference schedule per FBS Programs and Conferences. # of non conference games scheduled vs. BCS, NON-BCS and FCS opponents. # of non conference games won or lost vs. BCS, NON-BCS and FCS opponents. Ranked all 120 FBS programs based on each of those variables above. Examined and ranked all 120 FBS programs on the total number of wins and losses earned from 1996-present. Examined, analyzed and ranked all FBC conferences and programs scheduling habits among FCS programs. Examined and investigated each of the 6 computerized BCS programs to determine validity and which variables are used to calculate a number within their system. Analyzed, Examined and investigated the USA Today Coaches poll to and its subjectivity to credibility. Examined the affects of position differences associated with each FBS team ranked within the USA Today Coaches Poll. Examined the historical differences associated within the coaches poll comparing how many BCS coaches vote vs. Non-BCS coaches who vote to determine if there is a significant advantage. Examined the position differences within the coaches poll associated with winning, losing, dropped out and Idle. Within #13 I examined how position difference is affected when playing a BCS (home or away), Non-BCS(home and away) and FCS (home and Away). Examined if there is a possibility of voter bias within the USA Today Coaches poll with the assistance of peer reviewed journal articles to support my findings. I hope that helps answer a few of the questions asked of me on twitter. Please feel free to tweet me or follow me @cfbpoexpert, email me at cfbpoexpert@gmail.com , leave me a comment here after a post and keep reading this webpage. The next post will be either be the fictional 1996 playoff teams or fun facts….. The BCS did they get it right? Did the BCS get the first computerized poll right or is something wrong or missing? Upon further review of the 1st poll, something is most definitely missing and evidently wrong. If we examine the poll under a microscope we reveal the facts. 50% of the SEC is represented in both the BCS and USA Today coaches poll. Is that fair or is that vested interests based upon the significant advantage that the BCS coaches have in the USA Today Coaches Poll over the number of Non-BCS coaches whom vote? Alabama #1 in the BCS (6-0) record of opponents already played(19-19), and still needs to play an FCS opponent scheduled at the end of the season. Of those 6 games played only 3 possess winning records. FACT: Since 1996 , Alabama possesses the highest non-conference scheduling rate with a 90.1% home field advantage in non-conference games scheduled. Alabama 55 home games and 6 away games. Alabama 2 national championships. Alabama has only played 4 non-conference BCS programs away. Ask yourself this Q? Why didn’t Alabama play Michigan in Ann Arbor? I know that answer… do you. Florida #2 (6-0) record of opponents already played(21-18), and still needs to play an FCS opponent scheduled at the end of the season. Of those 6 games played only 3 possess winning records and 1 is at 50%. FACT: Since 1996, Florida possesses the 6th highest non-conference scheduling rate with an 83.3% home field advantage in non-conference games played. Florida 50 home games and 10 away games. Did you know that Florida has NEVER left the state of FLA for non-conference game since 1991 and that was at SYR. Prior to that, it was 1989 at Memphis. Florida 2 national championships. LSU#6 (6-1) record of opponents already played(19-19) and already played their FCS opponent. Of those 7 games played only 2 possess winning records and 1 is at 50%. Since 1996, LSU possesses the 4th highest non-conference scheduling rate with an 85.2% home field advantage in non-conference games played. LSU 52 home games and 9 away games. Did you know that since 1996, LSU has scheduled 37 Non-BCS programs at home and only 1 Non-BCS program away. LSU 1 national championship. South Carolina#7 (6-1) record of opponents already played(21-24) and still needs to play an FCS opponent scheduled at the end of the season. Of those 7 games played only 3 have winning records. Since 1996, South Carolina possesses the 18th highest non-conference scheduling rate with a 76.7% home field advantage in non-conference games played. South Carolina 46 home games and 14 away games. South Carolina 0 national championships. Oregon #3 (6-0) record of opponents already played (16-17) and already played their FCS opponent. Of those 6 games played 2 possess winning records and 2 are at 50%. Since 1996, Oregon possesses a non-conference scheduling rate of 71.7% in home field advantage in non conference games played, which is ranked in the top 1/3rd of FBS ranked teams. Oregon 38 home games and 15 away games. Did you know that since 1996, Oregon has played more non-conference BCS programs away than home. Kansas State#4(6-0) record of opponents already played (15-15) and already played their FCS opponent. Of those 6 games played 3 possess winning records. Since 1996, Kansas State possesses the 7th highest non-conference scheduling rate with an 81.6% home field advantage in non-conference games played. Kansas State 49 home games and 11 away games. Did you know that since 1996 Kansas State has played an even amount of non-conference games with BCS opponents home and away. Notre Dame #5 (6-0) record of opponents already played (22-16) and NEVER schedules an FCS opponent. Of those 6 games played 4 possess winning records and 2 are at 50%. Since 1996, Notre Dame possesses a non conference scheduling rate of 66.6% in home field advantage in non-conference games played, which ranks in the top 1/3rd of FBS ranked teams. Notre Dame 42 home games and 21 away games. Did you know that since 1996, Notre Dame has significantly played more BCS games non-conference games home and away than every SEC team by more than 200% or more. With this information, I did not count the records of any FCS programs played due to the fact that FCS programs do not play for the BCS title. How can you count something that does not have the fair opportunity to play for the BCS title. As for determining Notre Dames non-conference games, ask me. What does this mean….. It means that the SEC is more than likely receiving a significant voting bias by the human polls and manipulating the computers polls with scheduling advantages. Here is a funny FACT and missing from the BCS poll. Ohio U is (7-0) this year and not ranked in the Top 25 of the BCS or USA Today Coaches Poll, but is ranked 25th in AP poll. Ohio U. plays by the same rules as the rest of the FBS programs but not considered as a credible program. Right now they are the #1 seed in my 16-team playoff format. They have not lost any games this year. We will see how that plays out as the season progresses. What will be posted next.. stay tuned…..and follow along.